Nine tapestries comprise the series dedicated to the Book of Judith which is kept in the Church of Saint Nicholas of Bari in Burgos. However, not all of them are visible at once, since the arrangement for exhibition is based on sliding panels, and they can be contemplated just one at a time. An Assyrian king and a Hebrew heroine. This tapestry series reflects some biblical passages from the Book of Judith. The book narrates the story of the eponymous heroine from Bethulia who managed to destroy the Assyrian general Holofernes by seducing him, making him drunk and then beheading him. As a result, Holofernes’ army ran away and later was defeated by the Israelites. However, some of the scenes could well come from different sources. Moorish-style characters. 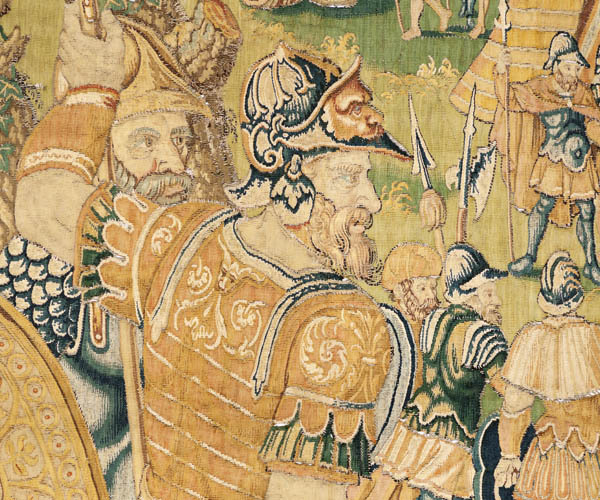 The attention paid in these tapestries to clothes, arms and other details, especially those reflecting Holofernes’ camp and troops, are noteworthy, as are the everyday scenes related to life in an army camp. At the same time, biblical scenes are not shown prominently; for instance, the arrival of Judith, the banquet in Holofernes’ tent and his death appear only in the background and in a small size. The Assyrians are represented in Moorish dress, with some garments of Turkish aspect. 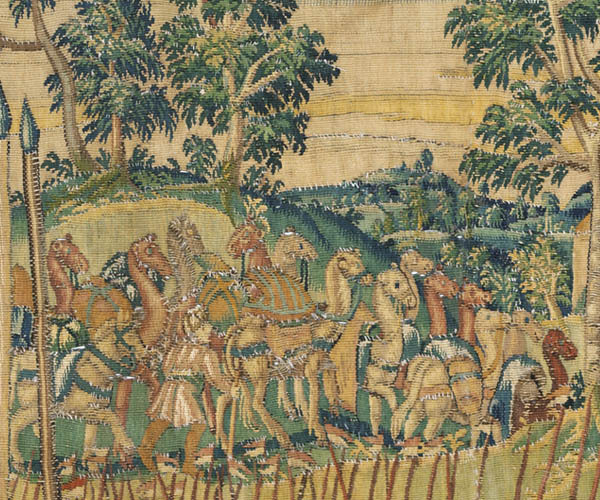 Disregarding the different quality of the pieces, we could draw a comparison to the tapestries on the Conquest of Tunis, made for Emperor Charles V by Pannemaker in the mid 16th century. In particular, one of the tapestries shows a weaver mark which resembles that used in Pannemaker’s workshop. 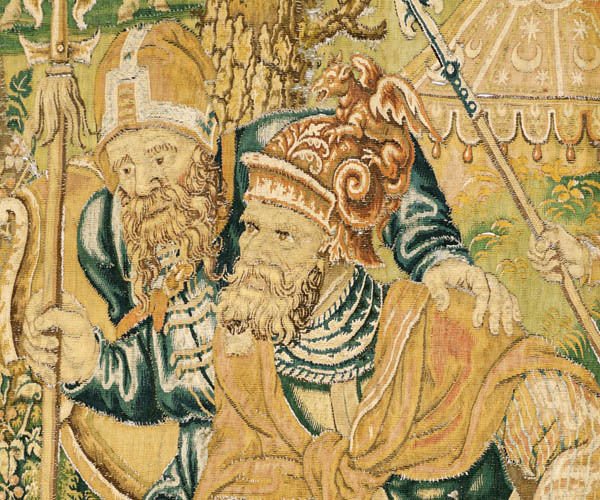 The first four tapestries seem to be focused on the story of Nebuchadnezzar, while the following ones show episodes directly connected to Judith. 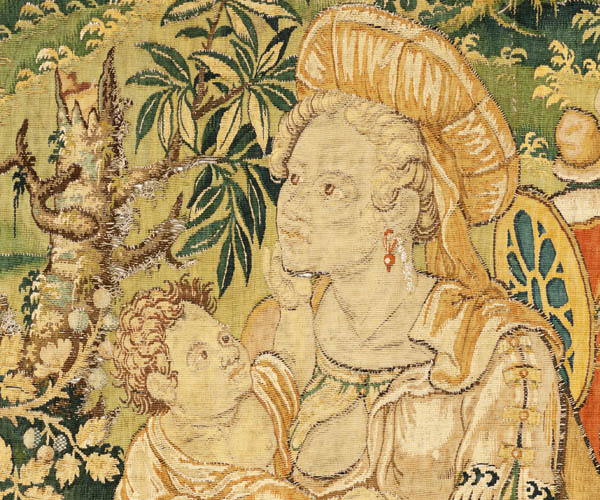 Tapestries from other series dedicated to Judith that are dated between the late 15th century and the first third of the 16th century are kept in New York, Rome, Brussels and Sens. Their iconographic origin differs from those exhibited in Burgos. A. S. Cavallo, Medieval tapestries in the Metropolitan Museum of Art, New York, 1993, pp. 190-197. G. Delmarcel, La tapisserie flamante, Tielt, 1999. Manufacture Netherlands, Brussels?, 2nd half of 16th c.